We collect music publishing and performance royalties on behalf of artists, songwriters and musicians. Since 2016 we also collect neighbouring rights on behalf of our clients, in collaboration with our partners at Performance Rights Limited. We offer various licensing and sync opportunities for our clients. Click here to find out more and see some of the brands we’ve partnered with already. We also pitch songs to record labels seeking original compositions. We provide management services on a variety of different projects, and currently manage The Nickajack Men from Falkirk. A fiery 5-piece who marry a perfect blend of country and alternative rock. 23rd Precinct also register live shows with PRS on behalf of our clients, in order to collect royalties for every performance. We work hard and alongside collection agencies to ensure accurate payments for our writers. 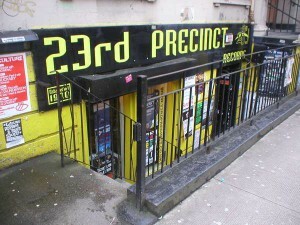 23rd Precinct Music Publishing was established in 1992 and grew out of the 23rd Precinct record shop in Glasgow. Created to support the launch of the store’s own record label ‘Limbo Records’, 23rd Precinct achieved substantial success throughout the 90’s and up to the present day. Now, the company continues to grow, establishing a presence known in the Dance Music worldwide and in recent years branching out to the world of singers and songwriters. Today we also work with recording artists such as The Nickajack Men who are also managed by the Director of the company, Billy Kiltie. 23rd Precinct is supported by long running partners Notting Hill Music, who are one of the UK’s leading independent publishers based in London. As we continue to grow and expand our roster with more singer-songwriters and exciting new projects, Notting Hill continue their support in our publishing company. Are you an unsigned writer, band or artist? Get in touch with us today to see how we can work together!